Construction Insure is a specialist construction broker and as such are able to give you a good understanding of what cover you need and a comprehensive policy with an A rated insurer for your Contractors All Risk Insurance. Contractors all Risk insurance is a terminology that is often got wrong by many brokers etc who are not up to speed on what insurances certain contractors should be taking out. It is essential to have this cover in place if you are a building contractor or a developer. Contractors All Risk Insurance covers you for the structure that is currently being worked upon if it is an extension of the current structure or if you are building a new build it will cover that structure from start to finish. Unlike a standard Public Liability policy which will only cover tradesman for damage caused tothird-party premises (existing structure) Contractors All Risk Insurance will cover any damage caused to the building works, for example if there is an unexpected flood, storm, or fire, it will even cover for poor workmanship. If a Building Contractor held only a Public Liability insurance policy and there was a fire, causing serious, if not fatal damage to the work outside of the original structure, then the insured would not be covered and may even be forced into liquidation. 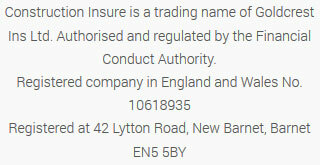 Yet, if the insured had taken out a Contractors All Risk policy, or a contract works insurance or a Contractors Combined insurance, then they would have been covered, as mentioned in their contract works section. Moreover, Contractors All Risk Insurance (in contrast to regular Public Liability Insurance) also includes cover for future claims made about work previously carried out by the insured. Contract works will cover you for loss or damage to building works while your company is responsible for them. For example, if your company is responsible for installing a dormer and accidently burns it down during construction, this is not a third party’s property nor is it part of the existing structure, therefore you will need this insurance to cover the cost in case an event like this does occur. Contractors All Risk will also insure your construction projects (both permanent and temporary), as well as all materials you’re using on the project and Plant and Contractors Combined will cover you for both above plus Liability insurance.